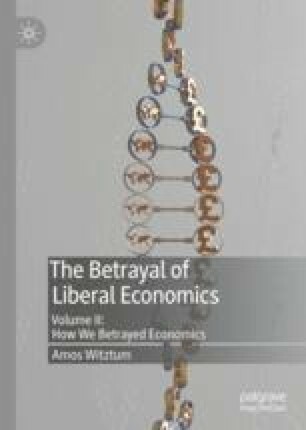 Synopsis : Up to now, the focus of our attention had been the way in which economics’ paradigmatic core betrayed us by its false promise. Here, however, we begin the examination of whether this lamentable state of affairs is not really a result of the way we—notably, the academic community—have betrayed economics. As modern economics is fundamentally an individualistic theory, its rise and fall are very likely to be associated with the accuracy and relevance, of the way in which it conceives the individual. Given that one of the main objectives of modern economics had been to create a theory which is both universal and ethically neutral—and, thus, suitable to all societies—it raises a question whether human nature does indeed lend itself to such an understanding. Does the conception of the individual in economic analysis take into account the fact that humans naturally live in societies and that economics is, in the end, part of a broader social system? Therefore, we begin our investigation into the origins of economics’ possible failure by inquiring about the nature of human sociality. The first port of call is about the possible meaning of being social. To have a clear vision of the subject, we propose from the outset two extreme visions of what human sociality may mean. At the one end, we have the purely functional view according to which, individuals’ sociality is a reflection of the usefulness of others to each individual. We form social ties or we care about the others because they are useful to us. At the other extreme we have the case where individuals are innately, or intrinsically, social and where social relationships have no obvious immediate functional purpose for the individual. It is evident that given that the origin of morality lies in sociality, the first extreme suggests a complete subjugation of ethics and society to the usefulness of the organisation to the individuals who formed it. The other extreme, on the other hand, suggests that ethics and social principle may precede the principles of economic organisation. We identify along this spectrum some key social thinkers like Hobbes, Locke, Spencer and Durkheim, and we are also able to position along it the conception of the individual embedded in both liberal classical and modern economics. By adding a question with regard to the possible origins of the social drives—on a spectrum between the instinctive and the cognitive—we are able to extend our investigation into some of the evidence emanating from evolutionary biology, anthropology and comparative neurology.